Home/NUTRITIONAL SUPPLEMENTS/BRANDS OF NUTRITIONAL SUPPLEMENTS/ALL STARS FITNESS PRODUCTS/ALPHA AMINO PM 96 caps. ALPHA AMINO PM 96 caps. THE FIRST WORLDWIDE EXCLUSIVE AMINO ACID FORMULA FOR USE BEFORE BEDTIME! 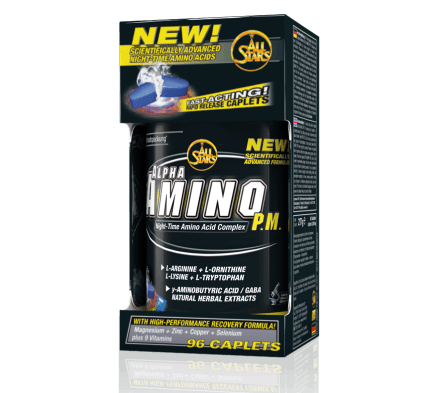 The new special amino acid formula of the ALL STARS' ALPHA AMINO P.M. is a fact. Adequate sleep is very important for muscle rebuilding, for increasing the levels of human growth hormone and for muscle recovery after intensive and tough workouts. It is impossible for a human body to function and perform without good sleep and relax. ALL STARS produced the first actual formula ALPHA AMINO P.M. consisted of amino acids and herbs which can improve the quality of sleep and contribute to muscular rehabilitation and development and it’s enhanced with GABA (gamma aminobutyric acid) a potent inhibitory neurotransmitter of the brain that provides relaxation and helps a person to sleep well and experience better recovery after a hard and intense training session. 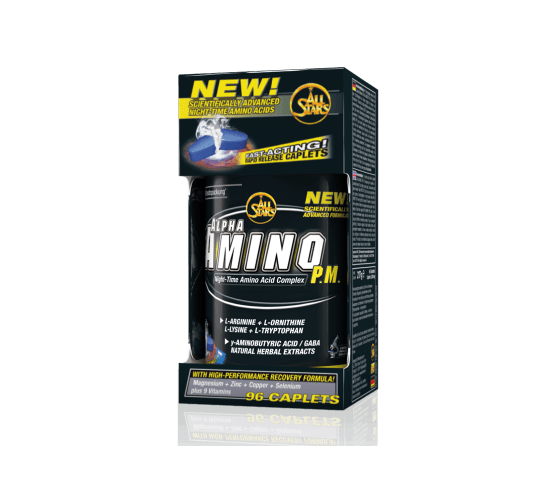 In addition, the ALPHA AMINO P.M. stimulates the anterior lobe of the pituitary gland by increasing the levels of human growth hormone for better muscular development and reduced fat storage. L-TRYPTOFAN / L- LYSINE: Both are essential amino acids that regulate sleep and support development, maintenance and general health of the muscle tissue. Lysine increases collagen production as well as the recovery rate of damaged muscle fibers. L-ARGININE /L–ORNITHINE: Both are natural releasers of growth hormone. The natural herbs found in the special formula of the ALPHA AMINO P.M. that help muscle development during sleeping hours are: Passion flower, rosemary, lavender flower, hops extract, and lemon balm extract. These herbs were initially used in America and later in Europe as a treatment for insomnia, anxiety and tension incidents. They also feature some strong antioxidant and anti-inflammatory effects and they induce natural sleep, sooth the nerves and fight anxiety. In conclusion, ALL STARS' ALPHA AMINO P.M. is specially designed to improve the production of hormones that are responsible for muscle development during sleep, it restores all the damaged muscle fibers after a hard and tedious day, it fuels the body with 9 essential vitamins and powerful minerals like magnesium and zinc that trigger natural testosterone’s production and improve the quality of sleep. The capsules can be readily absorbed providing all the active ingredients ALPHA AMINO P.M. contains, during the first crucial hours of sleep when the human body secrets most of its hormones. Combinations: ALPHA AMINO P.M. blends perfectly with L-glutamine capsules as well as with ALL STARS’ HY-PRO 85 protein supplement, by gradually releasing its power right before bedtime. It can also be used by advanced athletes combining it with ALL STARS’ TRIBUDEX 250. If this specific combination is done before bedtime, it acts synergistically and raises testosterone levels.